Have you noticed the faces that are showing up next to certain results when you do a Google search? The search results that have a profile picture have integrated Google Authorship on their webpage. This article demonstrates a search optimization strategy you don’t want to ignore. Google introduced the Authorship markup towards the end of 2011. By completing a 2-way link between your Google+ profile and a webpage, Google will recognize you as the author for that content. After the Panda algorithm update was released to combat duplicate content, Google launched Authorship as a way for content authors to claim the content and give the correct credit to the original author. Google Authorship puts more emphasis on who is responsible for content published online as opposed to what (brand). When I first saw it, I was all over it. Surprisingly, not everybody has adopted it yet. Now’s your chance to have your search result stand out. Any opportunity you have to make your search engine result stand out amongst the others should be capitalized. Here are just a few of the benefits. It has been proven to increase click-through-rate (CTR) in the search results. Your profile picture will stand out. People love pictures. Includes a direct link to your Google+ profile where users can add you to their Circles. Includes a “More by” link that links out to a listing of all webpage content you have claimed Authorship on. AuthorRank: If hundreds, or thousands of users have you in their Google+ Circles, you content will have more social influence and can provide a boost in the search results. Just like website can have a PageRank, authors can begin to build up their AuthorRank. If a user clicks on your search engine results, stays on your webpage for at least 3-5 mins, and then clicks the back button. Google will display three more webpages written by you. Google figures if they stayed on your page for that long, they must have enjoyed your content and wants to offer you more from the same author. Read more about this here. Google Authorship requires a 2-way link verification between your Google+ profile and the webpage. I’m going to show you how to add the link to your Google+ profile first, then give you three options to add a link to your webpage. Go to your Google+ profile and click the About tab. Scroll down and click the Edit link under the Contributor to section. Click the Add custom link link under the Contributor to section and add a link to a website you wish to claim Authorship on. You only need to link to the main website address, even if you are claiming a sub-page or blog post. 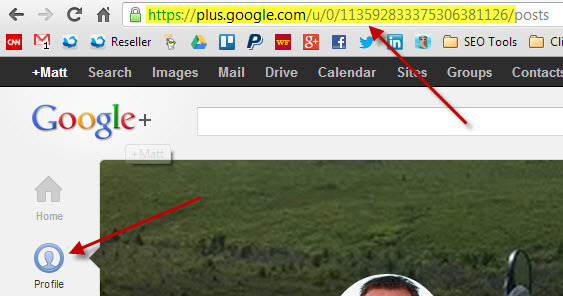 You can find your Google+ profile URL by visiting Google+ and clicking on the Profile icon. The link in the address bar is your Google+ profile URL that you will use in the steps below. This is a more technical approach and requires an HTML editor. If you want to add authorship to your entire website, you can add a link in the header of your site so that it will be present on all pages. The href tag should include a link to your Google+ profile. Make note of the rel=”author” tag. That is the most important part. Most website and blogs are built on the WordPress CMS blogging platform. One of the amazing features WordPress offers are plugins. 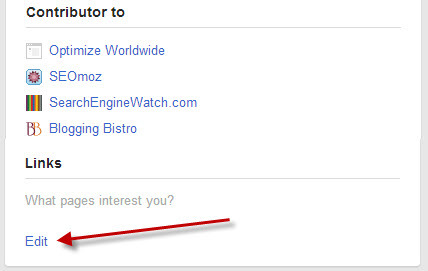 There are plugins for everything you can think of, including a plugin to help integrate your Google+ authorship link. There is no right or wrong plugin for this. Whatever one you prefer will work fine. I am a big fan of the All in One SEO Pack plugin for other SEO purposes. This plugin also adds your Google+ profile link for you. Go to WordPress dashboard > Users > Your Profile, and Fill in Your Google+ Profile URL. Click “Update Profile” to save. 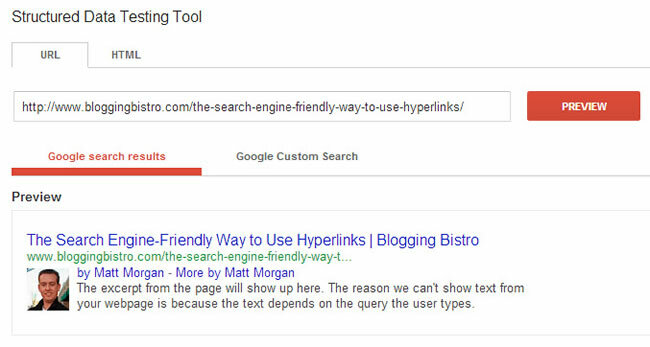 Any blog posts that are written by that WordPress user will include the Google+ Authorship link. Sounds technical, but it’s really easy. Let’s say you do not have access to the HTML, the website is not WordPress, or you are submitting your content as a guest post. You won’t have access to methods 1 and 2 listed above. 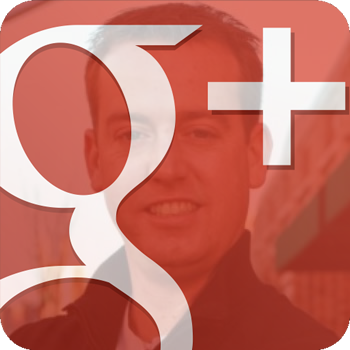 Here’s how you add your Google+ profile link with the rel=author tag to establish Authorship. Somewhere in the blog post or webpage, link out to your Google+ profile and amend ?rel=author to the link. Let me show you. Let’s look at the hyperlink code. Notice I’ve added ?rel=author to my Google+ profile link. How do I know if I’ve implemented Google Authorship correctly? There is a tool to test if you’ve correctly implemented the 2-way link verification. It’s called the Structured Data Testing Tool (AKA: Rich Snippet Testing Tool). The tool will tell you if Authorship is working for that webpage. If you see any errors, review the steps above to see if you missed a step. Enter your webpage URL and click the Preview button. Get in the habit of integrating Google Authorship on all content you publish online. You can go back and add Authorship to old content too. This is highly recommended. Build up an AuthorRank and let your search result stand out. If you have any questions or need help with any of the steps mentioned above, don’t hesitate to ask via the comments section below or by contacting me directly. You can follow me on Twitter @MattMorgan105 to see other topics I write about. 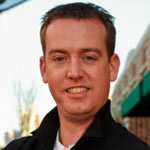 Matt Morgan is the founder and CEO of Optimize Worldwide, a web design & SEO company based out of Northern California. Matt writes for numerous SEO blogs, offering tips to help companies gain more online visibility in the major search engines through post panda/penguin website optimization, content marketing, and creative link building strategies. Offline Matt enjoys enduro motocross riding, networking with like minds, and hanging out with his wife Holly.